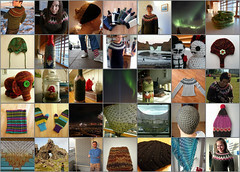 I think that a good way to start this blog is showing what I have been doing since I began to knit in December 2008. For those who don´t know, I always wanted to learn to knit but when we are in school (in Chile) that is something that only girls get the chance to learn while we (the boys) are working mainly on wood. I remember being still in med school (I must have been 23 or so) and I asked my mom to show me how knit... she thought it was a bit weird that I showed interest in something like that but she showed me anyways how to do knit stitch and we planned to make lots of squares to make a very colorful blanket. Everything changed when I moved to Iceland. I was suddenly in a knitting paradise where everybody learns how to knit and crochet at school and where there is a very strong knitting tradition. In addition to that I was unemployed so time was really not a problem. My first goal was to knit a lopapeysa because I didn't want to buy one, basically because by then I just couldn't afford one. So in March 2009 I finished the first one, Orói, that unfortunetely was too big for me but it was a great to have it done anyway and think: wow man, I did this myself! It wasn't until January 2010 that I could finally knit a lopapeysa that was the right size for me (Riddari). I was unemployed for one whole year. As I always say: knitting saved me from going nuts. For real. 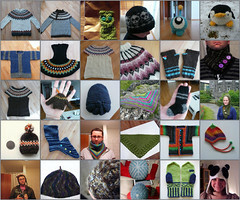 Looking at the pictures I realized that I have given away most of the things I have knitted: to family, friends, birthday presents, new born presents and just a couple of sales (not really my favourite thing to do). I am sure I will be going back to the old projects to talk a little more about them individually, to compare them with new projects or just to share them. Wow, has tejido un montón de cosas! Y no es por nada, pero todo te queda bien padre :) Ya tienes otra fan de tu blog! Martha! Qué bueno verte por aquí! No sabía que también tenías un blog! Le di un vistazo y está padrísimo! Piensas volver a escribir pronto? Rodrigo, estoy absolutamente impactada y con la boca abierta de los maravillosos tejidos que has hecho, wauuuuu,FELICITACIONES!!!!!!!!!!!!!!! Y me parece haber entendido que eres chileno??? verdad? y cómo llegaste tan lejos hombre???? This is a Flickr badge showing public photos and videos from Род Муноз митев. Make your own badge here. Playing with Bobbin Lace and a Terrible Accident! / Jugando con encaje de bolillos y ¡un terrible accidente! I am finally posting!! / ¡¡Al fin escribo una entrada!! First blanket: Done! / Primera manta: ¡Terminada!